Beth, the Canadian art student behind Rolling Rabbit Productions, accepted a design challenge to swap the genders of Mario, Luigi, Peach, and other familiar faces from the Super Mario video game franchise. It. Is. Awesome. Lady Mario's overly-confident pose feels perfectly appropriate for the series' main hero. Conversely, Luigi as a woman (Luigini?) comes across as a tall, shy, and awkward rendition of himself, which also fits (and feels close to home.) 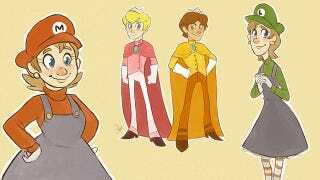 Peach and Daisy come across looking like dashing Disney princes in their gender swaps, with Prince Peach looking just a little bit shy, per usual. And somehow, every one single of them have fantastic-looking boots — did a John Fluevog store recently open up shop in the Mushroom Kingdom or something?